The author, A.J. York, gave me a copy of this novel in exchange for my review. Delilah Dusticle is delightful. The first book in the Dustbuster series (click here for my review) dealt with Delilah’s recovery from heartbreak and finding happiness and peace within her special skills. This second novel is Delilah Dusticle’s Transylvanian Adventure (Delilah Dusticle Series) is light, fun, sweet and thoroughly entertaining. Delilah is the Pippi Longstocking for the modern child sharing the same innocent and sweet nature with the iconic character with a solid sense of good fun and good friends. While Delilah Dusticle’s Transylvanian Adventure (Delilah Dusticle Series) isn’t about sadness or heartbreak, the author did address that sometimes its okay to be sad which I think is an invaluable lesson for our children. So often I see parents worried if their kids aren’t upbeat and happy all of the time but we all have off days and sometimes those days are just pensive. Delilah sheds her silvery dust sometimes just thinking slightly melancholy thoughts. We as humans aren’t one note and this story highlights that idea for kids in a helpful, fun and understated way in the idea of Grumpy Sponge. Grumpy Sponge is a great character. The sponge can be happy and helpful or take cues from Delilah and act out her displeasure in a funny way. Gavin Childs is to be commended for the illustrations. They were well drawn, very suited to the story and quite humorous. Alex is now 12-years-old and the upper end of this market. When I gave her the novel to read she thought it very wise of York to make Dracula a friendly character as leaving out the horror element broadens the market. Alex likes that the story is set in the past and finds Delilah fun and sweet. She thought the way the store was written was very sweet and would serve a child just learning to read on their own well in a transition from picture books to chapter books. Though set in the past, Alex thought any child who likes the Disney animated movies would embrace Delilah Dusticle. I watched as she read curled up on the couch with a smile on her face and the occasional giggle as she read. 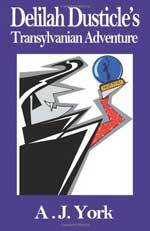 Delilah Dusticle’s Transylvanian Adventure (Delilah Dusticle Series) is truly a fun and feel good piece perfect for the middle grade child and the young at heart.